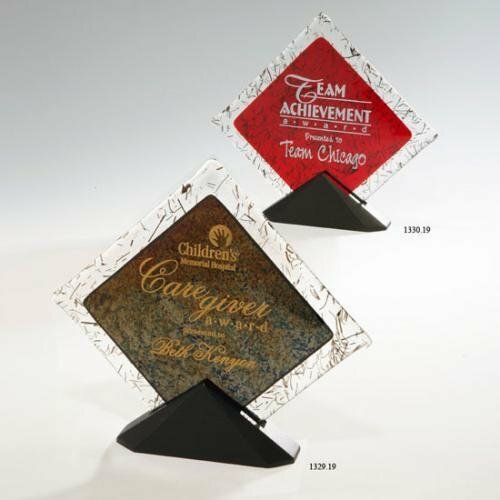 These elegant fused art glass awards are an exquisite combination of black stringer glass and transparent red or gold mounted to an ebony finish Stonecast™ base to create a stunning recognition piece. 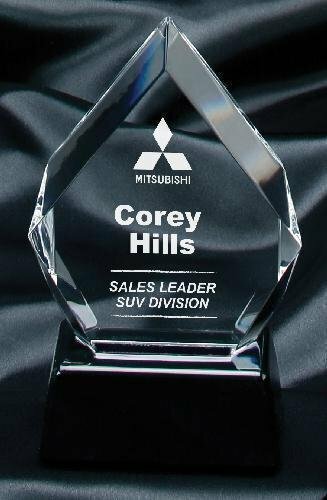 A stunning diamond shaped award with an asymmetrical bevel on the front. This bevel gives it a beautiful but simplistic look that is perfect for anyone. 5 3/8" x 5" x 3/4"
7 1/4" x 7" x 3/4"
A stunning award raised high on pedestals. Let them know that they have risen to the occasion with our beautiful Diamond Award. 9" x 11" x 1/2"